PRINCETON, N.J. -- Although the Social Security program continues to face long-term funding challenges, U.S. nonretirees are more likely to say Social Security will be a major source of income in their retirement than they have been at any point in the last 15 years. The current 36% of nonretirees expecting to heavily rely on Social Security is roughly 10 percentage points higher than a decade ago. 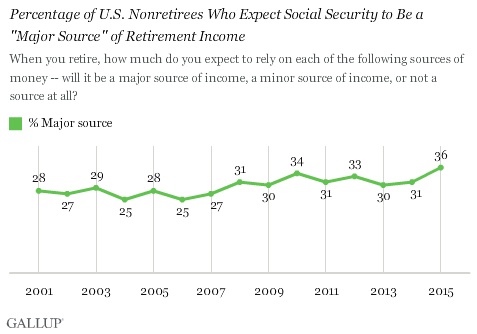 In addition to the 36% of nonretirees expecting Social Security to be a major source of retirement income, another 48% believe it will be a minor source. Fourteen percent do not expect Social Security to be a source of retirement funds for them at all. These results are based on Gallup's annual Economy and Personal Finance survey, conducted April 9-12. Generally speaking, the older nonretirees are and the lower their household income is, the more they expect to rely on Social Security as a major source of retirement funds. Close to half of nonretirees aged 55 and older, and of nonretirees whose annual household income is less than $30,000, say Social Security will be a major source of funds. 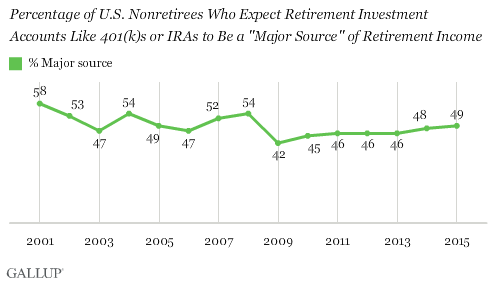 There are not sufficient sample sizes in any given year's sample of nonretirees to analyze yearly change. 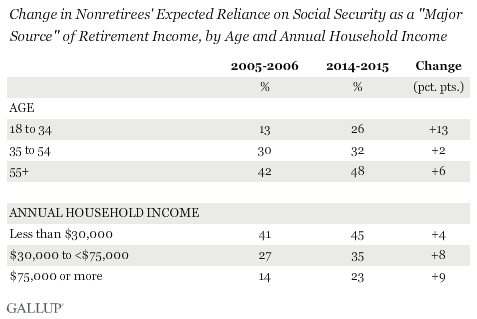 However, a comparison of combined data from the 2014-2015 surveys and combined data from the 2005-2006 surveys shows at least modest increases in expected reliance on Social Security among nonretirees in all age and income groups. There have been proportionately smaller increases among older and lower-income nonretirees, who were more likely to name Social Security as a major source in the past, and greater increases among the groups that were previously less likely to expect to rely on it. Even as nonretirees increasingly expect to rely on Social Security in retirement, they are still most likely to name retirement investment accounts, such as 401(k) plans or Individual Retirement Accounts (IRAs), as a major source of retirement funds. Each year Gallup has conducted the poll, 401(k) and other savings plans have topped the list. Currently, 49% say such plans will be a major source, essentially unchanged from last year but up slightly from an average of 45% from 2009-2013. In the past, as many as 58% of nonretired Americans expected to rely on 401(k)s or other retirement savings accounts as a major source of money in retirement. That came in early 2001, shortly after the dot-com economic boom. After 401(k) plans and Social Security, the next-most-common expected retirement funding sources are regular savings accounts and CDs (27%), work-sponsored pension plans (25%), part-time work (21%), home equity (21%), and individual stocks or stock mutual fund investments (20%). In addition to the changes in nonretirees' expectations for Social Security and 401(k) plans over the past 15 years, there have also been modest declines in the percentages of nonretirees expecting pension plans, home equity and individual stock investments to be major sources of retirement income. There have been modest increases in the percentages expecting to rely heavily on regular savings and part-time work. 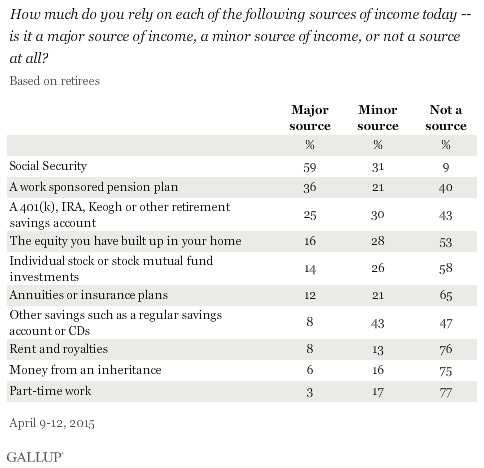 Gallup has consistently found Social Security to be the clear leader when current retirees are asked about their major sources of income. This year, 59% of retirees say Social Security is a major income source for them. Though the percentage has varied in any given year, a majority have said this each time Gallup has asked the question. Pension plans have consistently ranked second on the list of retirees' major income sources, with 36% saying so this year. Retirement savings accounts like 401(k) plans and IRAs, and retirees' home equity have typically been the third- or fourth-most-common sources. 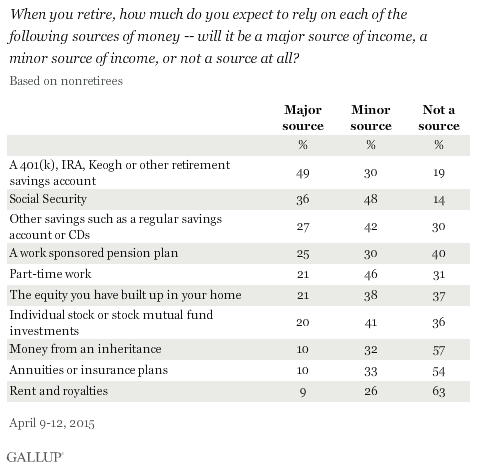 Currently, 25% of retirees name 401(k) plans as a major source and 16% list home equity. There has always been a bit of a gap between future retirees' expectations for how much they will rely on Social Security and current retirees' actual reliance on it. To some degree, that may be a product of changes in the laws affecting Social Security. Specifically, many of the Social Security reforms passed in recent decades were designed to affect future generations of retirees but not those who were receiving benefits or were near the point where they would be. The long-term funding challenges the Social Security system faces may also be a factor in why nonretirees expect Social Security to be less of an income source in their retirement. Nonretirees are becoming more likely to view Social Security as a major source of their retirement funding than they were a decade ago, although the changes are not dramatic. That may partly compensate for the slight drop in expectations of 401(k) and other investment plans as a major source since then. Fewer Americans are invested in the stock market today than before the recession, even as stocks and mutual funds have been strong investments in the last couple of years. But even those who are actively saving and investing for retirement are not highly confident their savings will be enough. According to a recent Wells Fargo/Gallup retirement survey, just 28% of nonretired investors are very confident they will have enough savings at the time they elect to retire. Another 48% are somewhat confident. To the degree nonretirees' savings are not sufficient to fund their retirement, nonretirees will have to make up the shortfall somehow. The guaranteed Social Security benefit is an obvious way to do that, if not by also seeking part-time work or scaling back their standard of living considerably. For results based on the sample of 652 nonretirees, the margin of sampling error is ±5 percentage points at the 95% confidence level. For results based on the sample of 363 retirees, the margin of sampling error is ±7 percentage points at the 95% confidence level.